SPACE STATION FLYBYS: Sky watchers in Europe and North America are in for a treat. For the next few days, the International Space Station will be orbiting over the two continents, appearing brightly in the morning and evening sky. Check the Simple Satellite Tracker to find out when to look. Sabine also told lunar time and tried (but failed) to become an astronaut. Next time she plans to take her space suit. 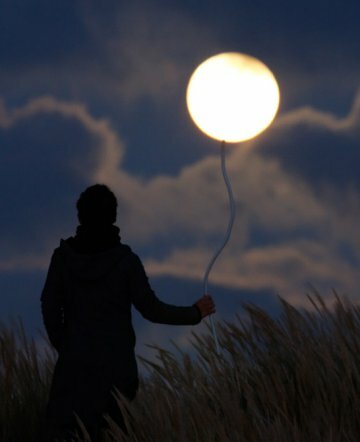 Laveder took all these pictures using his Canon 350D, a good camera for a bit of lunacy. 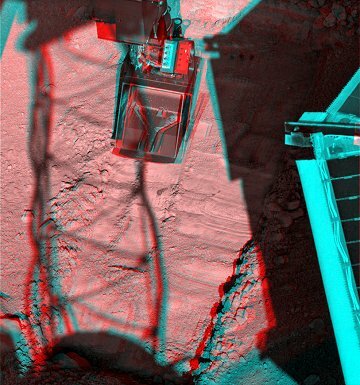 Spaceweather reader Stuart Atkinson of Kendal, England, created the anaglyph by combining left- and right-eye images from Phoenix's stereo camera. "I love this view," he says. "It shows so much detail: Phoenix's scoop hovering above the ground; the shadow of the camera mast on the scoop and the ground beneath it; the ragged edge of the trench, with small rocks and stones tumbling into it; scratches and scrapes on the trench floor made by the sharp edge of the scoop. It's just like being there." At the moment, Phoenix is drilling into a layer of ice at the bottom of the trench using a motorized rasp located on the back of the scoop. The purpose is to create a pile of "shaved ice" that the scoop can pick up and dump into one of Phoenix's ovens for analysis. Mission scientists want to know if martian ice contains nutrients and minerals that might support microbial life. Stay tuned for updates. On July 18, 2008 , there were 962 potentially hazardous asteroids.